Fall – isn’t it everyone’s favorite season? While we share many reasons for this feeling we each have our own, and lately I’ve been thinking about why this time of sweetness with a pinch of melancholy whose beauty flares so briefly, strikes me as it does. Its brevity makes it all the more precious. I remember a day when I drove along Paradise Valley in Montana on the way to Gardiner and the miles of sunlit cottonwoods made my heart swell until I thought it might burst. A few hours later, I drove back to Bozeman bereft. The wind had come up and the leaves had come off. Did I only imagine their molten gold and amber? 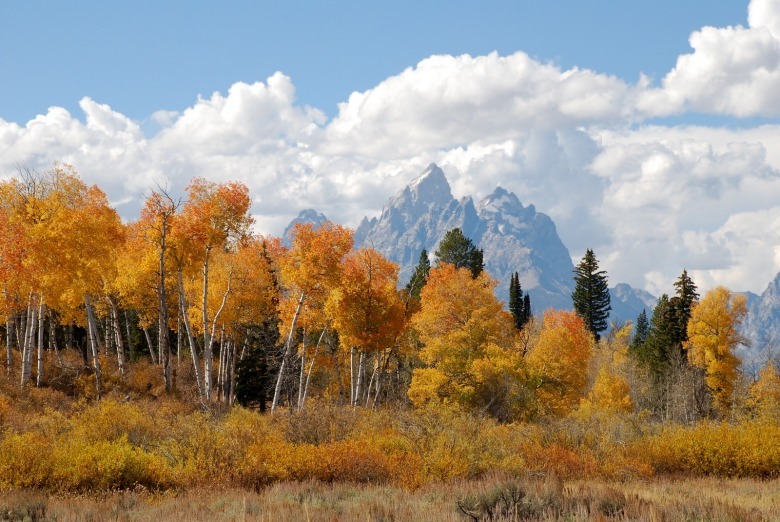 Paradise Valley’s famous wind can eliminate fall’s beauty in an hour, while other river valleys in the Greater Yellowstone Ecosystem generally keep their colors for a week or more. 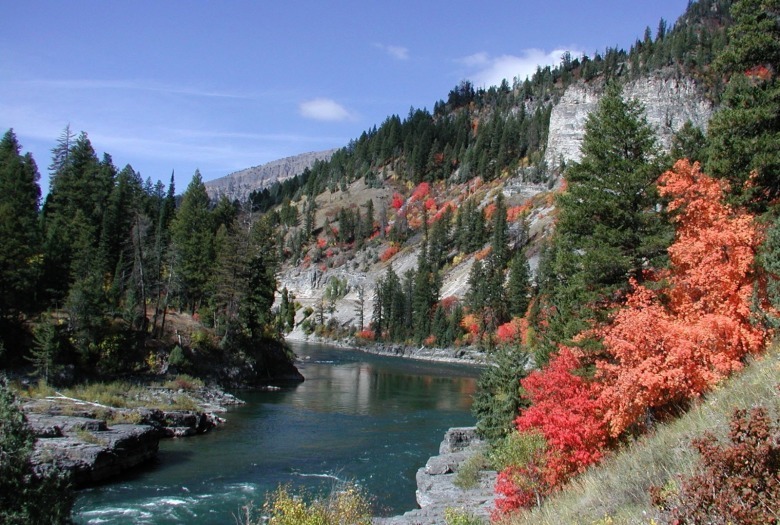 The Snake River Canyon near Alpine, Wyoming, glows with the reds of bigtooth maple. 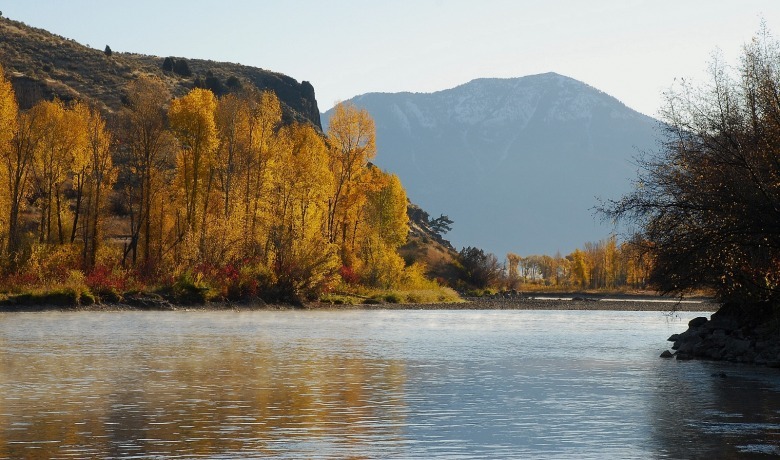 Downstream, the river’s South Fork offers a mix of cottonwood, aspen and colorful shrubs like willow, serviceberry and chokecherry. Pick a favorite creek or river and its seasonal rewards await, at once easing our transition out of summer and reminding us of the dark and cold to come. In autumn, raking sunlight filters through translucent leaves, setting them off against the sky. Even the weedy smooth brome absorbs the light. All this beauty makes me want to be everywhere at once, in the midst of all my favorite aspen stands from past years, a place on the river where maroon and scarlet dogwood leaves reflect on the deep blue water. Being human and therefore greedy, I want to rush around to experience it all, to gather it like a basket of berries, during a season that wants to slow me down and like the river, reflect. We call it fall for a reason, and here is where the minor notes come in. Wildflowers fade, migrating birds depart, and summer’s green fades to straw-brown. The tomatoes we babied for months, even hauling them into the garage every evening, dangle from limp vines. Everything is falling into decay, entropy, disenchantment. The season itself seems uncertain of this path, as days begin in the mid 20s and by late afternoon it’s fifty degrees warmer. Torpid fritillaries come to life and dip between the last rabbitbrush blooms. Grasshoppers take flight, showing off their yellow and orange inner wings. Hornet nests the size of basketballs begin to empty, leaving survivors to wander around lost, sipping aphid sugar from sticky leaves, trying to steal the chicken off my sandwich. I feel sorry for them. I don’t react this way the rest of the year. Winter solstice is worth celebrating for the return of the light, though we usually do our celebrating in down jackets around a campfire, raising a quick cheer before retreating back indoors. Spring equinox in these parts is really just winter with more sunlight. Maybe the snowbanks in town are starting to recede, maybe a tiny Orogenia will lift its blooms by then but usually not until April. Summer solstice comes too soon, and after a particularly crappy May, it seems like spring has just begun. In spite of my appetite for more and more, I fall into the season’s slowing pace. Fall occupies the same space as the others on my calendar, but it feels like a singular moment, a bead of sapphire water suspended in time before it drops into the future. That moment in time is my quarry in my daily wanders between aspen stands. I try to hold onto it with photographs, field notes, even some doggerel once in a while, to save what cannot be captured. Humans have known seasonal change since our beginnings of course, naming the full moons for whatever we were busy doing (harvesting corn or wild rice, for most of North American natives) or for what we experienced as less-techy beings living in the world: cold. Starvation. So it isn’t clear to me why this particular change in season inspires me like no other. In the northern hemisphere it’s the time of stocking up for winter, as the squirrels, chipmunks, and bears are busy doing. As our ancestors have done for millennia and many still do. I don’t count the handful of tomatoes from my garden, which wouldn’t provide enough calories for a day. But I do change gears. Gone are the plant books and hand lenses of summer; instead I wander the lower slopes, not listening for but noticing the quality of sound as my footsteps land in stiff dry seedheads, freshly fallen leaves, or softly fading pinegrass. Crunch, swish, silence. The music of change. Summer slides into fall, youth into age, dense forests into blackened snags, precarious slopes into landslides. We know this, but in our daily lives when we aren’t paying attention we often act as if everything is stable and permanent. Youth, for instance. I have a vague memory of being able to string long hikes together day after day, collecting photographs of stunning landscapes. I still want to do that, but my knees say no. Some of my favorite stands of aspen, an hour’s drive and three hours of hiking away, are those I’m unlikely to visit again, and I have come to prefer the shorter drive, the closer beauty, the favorite stands that I can still return to again and again. Those distant places have done their job, giving me a lasting appreciation for the wonders of the natural world that bring much solace in a time of turmoil. But the day will come when I no longer remember them or anything else. I’m like the leaves themselves, going through the stages of dropping scales in April, budding out in May, growing large and green all summer, then heading home to mother earth. We assume our homes to be there, until they aren’t. This month we’ve witnessed floods in the Carolinas, earthquakes in Japan, and unless we know someone who lives there and even if we do it all feels sort of abstract. But then a wildfire kicks up in our neck of the woods and we know people whose houses are at risk, whose precious stuff we have stored in the basement. Most of us complain about the smoke, the inconvenience of dusty views, and the real health hazards to those with compromised breathing. The fire isn’t at my doorstep today but it could be tomorrow. There’s a slope full of Douglas-fir a quarter-mile away. 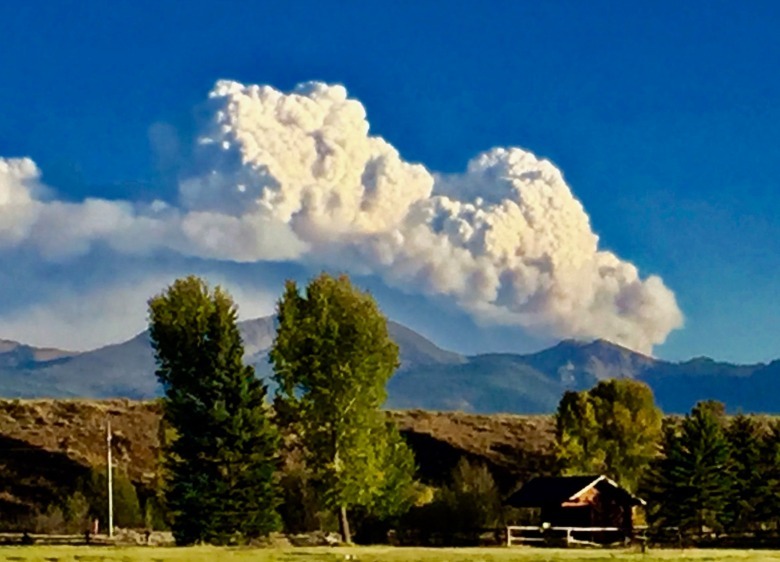 And while I’m safe for the moment, I can’t help thinking about the handmade cabin that a now-deceased husband made from logs on his property, in the path of the giant Roosevelt Fire in the Wyoming Range. The dozens of homes that have already burned. We’ve superimposed our imaginary permanence on an ever-changing world and try to hold it at bay with seawalls and firebreaks and levees. How else can we live when our numbers are so huge they’ve overwhelmed the inhabitable parts of the earth? We do well to remember that as much as we seek safety and security we live on unstable ground. "We’ve superimposed our imaginary permanence on an ever-changing world and try to hold it at bay with seawalls and firebreaks and levees. How else can we live when our numbers are so huge they’ve overwhelmed the inhabitable parts of the earth? The lucky ones among us can live with the illusion of security for most of our lives." The lucky ones among us can live with the illusion of security for most of our lives. But the one thing we can’t avoid is the end of it, the final path we have to walk alone. We deny it with our youth-centric popular culture, and we might accept it better if we lived with impermanence beforehand. Setting my mind to this reality while living day to day in my so-called permanent house and town sets up a major cognitive dissonance. I think I understand the concept of impermanence but like the wildfire now consuming a good friend’s home, it’s abstract, imaginary. I’m not sure what to do with that – loving this time of beauty with each day clear and warm and dry, knowing that the same conditions are causing suffering for others. 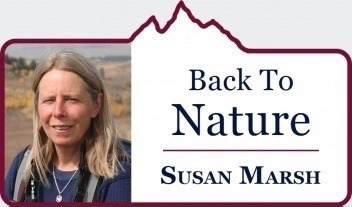 Here in the Greater Yellowstone Ecosystem many of us want to live with nature, but do we really? Abandoning a poorly-placed house in front of a wildfire is not quite what we had in mind. We superimpose our growing infrastructure over the land with the permanence of concrete, asphalt and steel and expect that only the benign parts of nature will intrude. No floods or fires, thank you. Wildlife okay as long as no one eats my shrubs. We paddle on the river, hike in the mountains, and come home to our heated indoor spaces with electric lights that truncate autumn nights. Instead of looking at dusk for bats to see if they have migrated yet, or listening to the last grumpy muttering of a robin at roost, I sit inside at the computer and write this. While I have made an attempt, not for the first time, to delve into the state of mind fall brings, I have no conclusions. Perhaps it’s the ineffable quality of the season that I really love, and there’s no advantage in parsing the mystery out of it. Understanding pieces like the names of chemicals that contribute to fall colors will never get to why the fall pierces my heart. But we’re people and we’re always trying to understand. Like a blind man with my two square inches of the elephant, I hold small scraps of knowledge: it’s late September and time for the sandhill cranes to stage. But how do they know where to meet up? How do they know where they’re going? Recently a friend and I sat on a mountainside squinting and searching for the source of the calls we could hear. Finally I spotted a few black dots circling together between a band of cirrus and the blue above. Out of nowhere a smaller group of dots veered in their direction to join the flock. They were so high we could barely see them without binoculars. Such voices – designed to be heard from long distances so they can keep track of each other. I think of the loudest bird I know, maybe a crow or magpie. If it was that far away I’d not only fail to see it, I’d never hear it either. 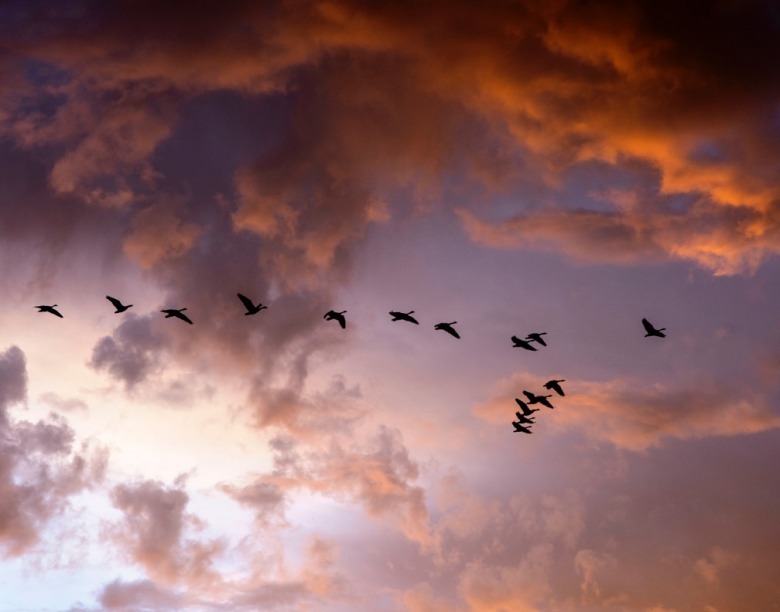 We watched the cranes come together until there were ten, still circling, still gaining elevation, still spilling their ancient calls onto the ground below. We took our eyes away for a moment and they were gone, like the cottonwood leaves on the Yellowstone River. I hear their voices now. The beauty of cranesong brings tears to my eyes while I wish them well on their travels. Part of me says see you next spring, and another part says please don’t go. I don’t quite use words like that, as the feelings rise from a part of me that dwells beyond thoughts or words. They rise from the belly like the contraction before a sob. Sometimes I think the act of taking photos or stopping to jot some notes places distance between myself and the experience I desire. Yet it can also work the other way, as composing a picture makes me pay more attention. Drawing in a sketchbook even more so. But the focus of attention needed for these studies drags me back into technology (Do I have the right F-stop? Is the pencil sharpener in this bag?) instead of experiencing the moment, from leaf detail to distant cranes, with my whole self. I go out without the camera, feeling like a body limb is missing at first. Eventually I feel more comfortable in my animal/deeply human self without it, lying on soft bent-over pinegrass while the dog indulges in a good roll and back scratch, moaning with pleasure. She stands up and shakes, comes over with a dog-smile on her face and gives me a good once-over sniff. Why am I just lying there, she wonders, watching the clouds drift over between ignited aspen leaves? My back doesn’t itch, so this is my way of maximizing the experience, to sense it fully. She goes back to rolling in the grass, her way. As these fall days darken, the season asks me to abandon my trappings of modernity and join the world of organic wholeness. Not man apart: remember that coffee table book put out by the Sierra Club? Now is the time of year when I feel most a part of the nature and my heart beats with its pace. * from The Answer, by Robbinson Jeffers, entire poem below.